Q. You have said that meditation burns karma. How do we know that is happening? Sri Sri: It just happens! It’s natural. You keep anything on fire, it gets heated up, and so meditation definitely erases the past impressions. You know one of our devotees has made a nice movie – it says how this entire universe is nothing but a space, and what we consider matter, simply doesn’t exist. You know Dr, Doer is one of the greatest quantum physics scientists today. He told me something very beautiful. 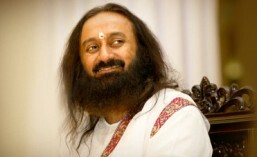 ‘Guruji, I have been teaching for 35 years, I am doing research on matter that doesn’t exist (laughs)! So what we consider the sub atomic particles, these are simply wave functions or vibrations. So the entire universe is nothing but vibrations, and that’s what the vedas have declared thousands of years ago! Accordingly, everything is made up of sound vibrations, called Mantras. Mantra is that vibration which contains information and knowledge. Today’s information technology makes it so easy to just click a button, and send any information that goes into space and gets transmitted all across the globe and even beyond our solar system. And this is exactly what our Vedic Rishis have stated for ages. They believed that in every particle, atom or vibration the entire universe is encapsulated in it. Today, an entire book can be loaded in a pen drive, if you had said this a few decades ago, people would have laughed at you!. But our ancestors have said that – in a bindu, in a drop – the ocean is contained; in one grain the entire cosmos is contained, similarly in one human’s soul, the vast infinity is contained, Paramatma, the divinity. It is true that knowledge and wisdom is contained in every particle of this universe, in totality! That’s why it is said – every particle is total in this universe. So we are made up of some 50 trillion particles and each particle represents you. Each particle contains all the information in the universe. Isn’t that amazing?! Each human DNA contains all other species of the universe that means in one human DNA you can create any animal, or species of this universe. An elephant can be created out of your DNA, or even a scorpion, butterfly or a dinosaur! That means every little particle in the universe contains all the information and this is what the ancient seers said – Gyana.– means concentrated, solidified knowledge present in every individual particle. And that’s what our consciousness is – Anand Gyana, it’s concentrated bliss and it is consolidated knowledge, and that is what our consciousness is! What we see as an empty space around us is not empty but filled with bliss and knowledge. It’s amazing to know that we can relax and get connected to that energy field around us . So after all, we are already connected! Isn’t that good to know?